Last week, when it was supposed to be snowing but actually it was just dumping buckets of rain on my part of the world, I came up with this. 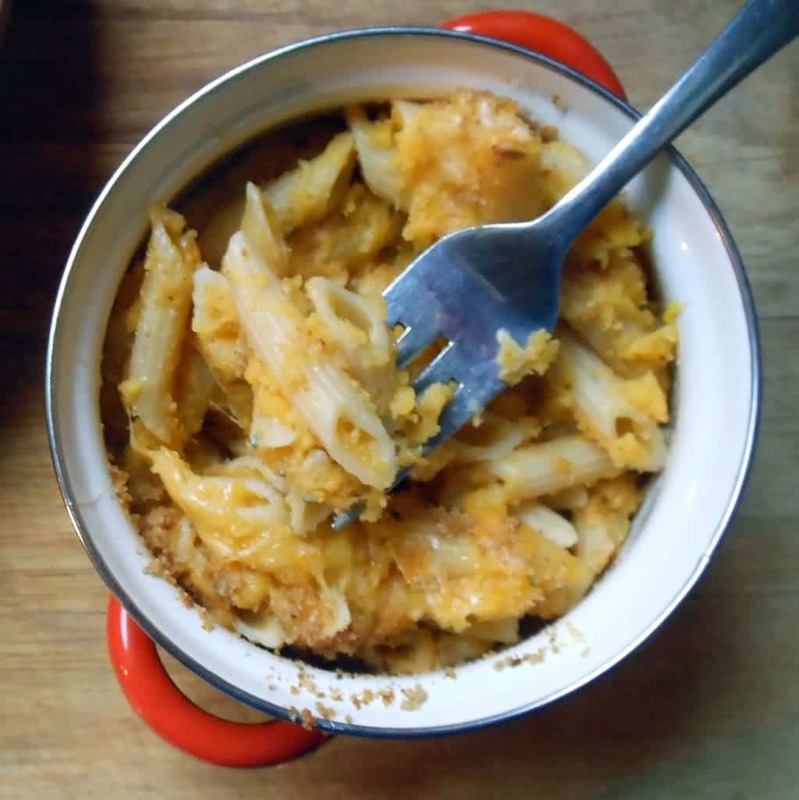 This winter, while the weather has been so wholly unsatisfying, things like this butternut squash macaroni and cheese have totally kept me going. This is wear-warm-fuzzy-socks-and-pull-them-up-to-your-knees food. And you know, I don’t even like to wear socks. It’s the kind of meal that makes you glad for things like flannel pants and comfy couch corners and knitted throws. Makes you crave lazy afternoons and extra hot lattes and really good books. Typically all of this would conjure up something like a big ‘ol bowl of soup. I’m not opposed to soup. My family however is a different story. Unless it’s chili these guys are no kinda soup eaters. But mac ‘n’ cheese? One of their favorites. And surprisingly, they aren’t opposed to my adding vegetables to the mac ‘n’ cheese (Can I still call this macaroni and cheese when I’ve technically used penne instead of elbows? You know, like when you buy “Shells and Cheese” they are very specific about the shape of the pasta on the box, though I’m pretty sure they should stop calling that stuff cheese… food for thought.). The little guys are not down with green veggies in the macaroni (?) though- except broccoli. They are down with broccoli. Evan will have none of this cooked spinach or peas nonsense. I think their taste buds are broken. Anyway, maybe it was because the colors matched up nicely? Maybe (definitely) I could have gotten away with adding sweet potatoes instead of squash? Or pumpkin? Any of those could work here quite nicely. But the butternut squash was just exactly the right amount of sweet. 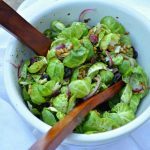 And paired with a salad (according to Evan salad is acceptable green, as long as there is Raspberry Walnut Vinaigrette dressing… ?) 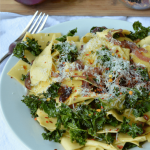 this is a warm cozy meal that is good for you and super filling. It also makes a ton (technical kitchen terms here) so there were leftovers for daysssssssss. 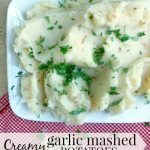 If you’re thinking of this for a side dish, unless it’s a potluck contribution, I’d definitely go halfsies on the recipe. Pre-heat the oven to 350. Spray a 9 X 9 baking dish or 9-inch pie plate with nonstick cooking spray. Place the squash in a large sauce pan. Cover it with water and bring it to a boil. 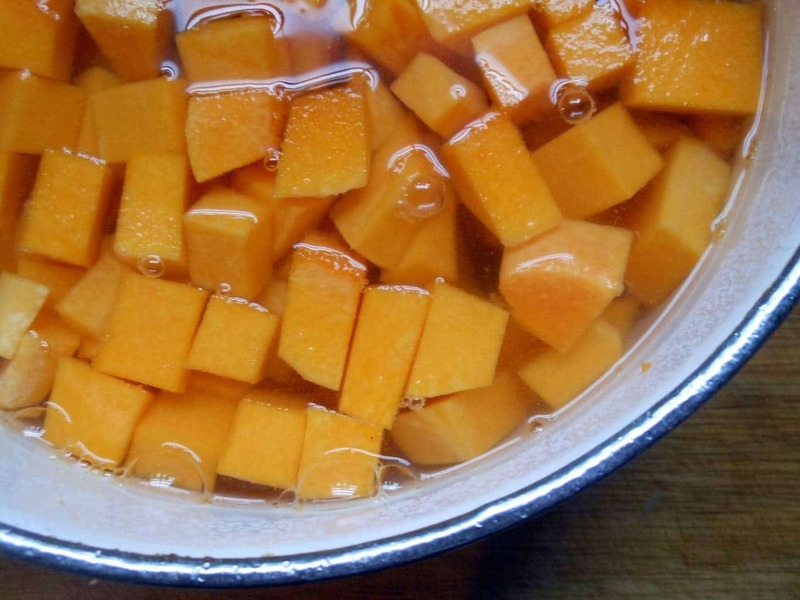 Reduce the heat, cover and simmer until the squash is fork-tender, 12-15 minutes depending on the size of the squash pieces. Drain, re-cover (to keep it warm) and set aside. While the pasta is cooking mash the squash until it's smooth. Stir in the milk, salt, cinnamon, and nutmeg. Stir 1 cup of the cheddar/jack and all of the shaved parmesan cheeses into the squash mixture until they've melted. Drain the pasta, empty it back into the pot you cooked it in, and stir it with the squash/cheese blend until the pasta in evenly coated. Empty the pasta into the prepared baking dish. 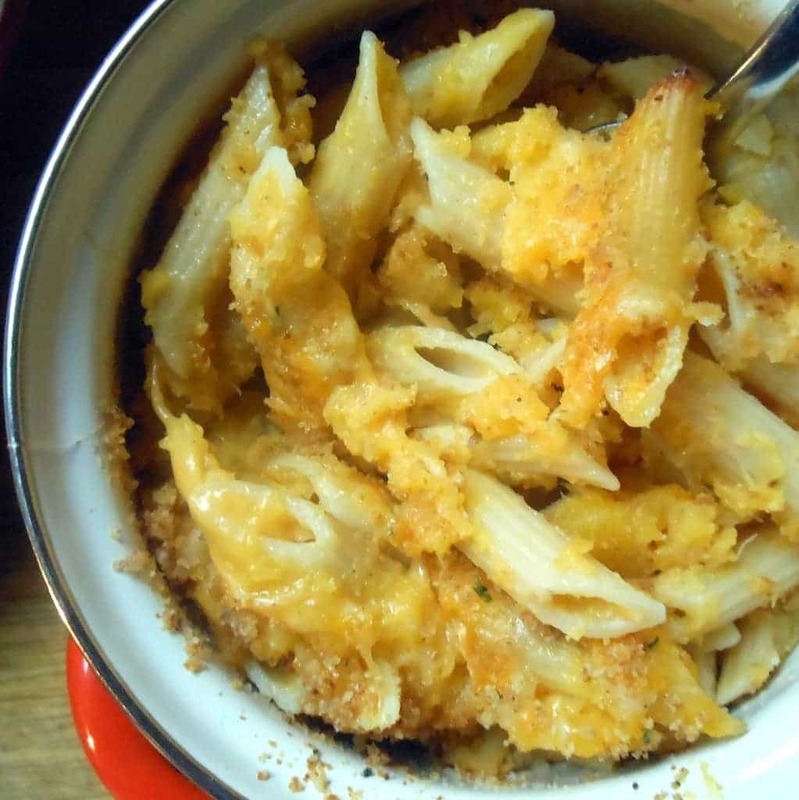 Sprinkle the remaining ½ cup of cheddar jack cheese over the top of the pasta. 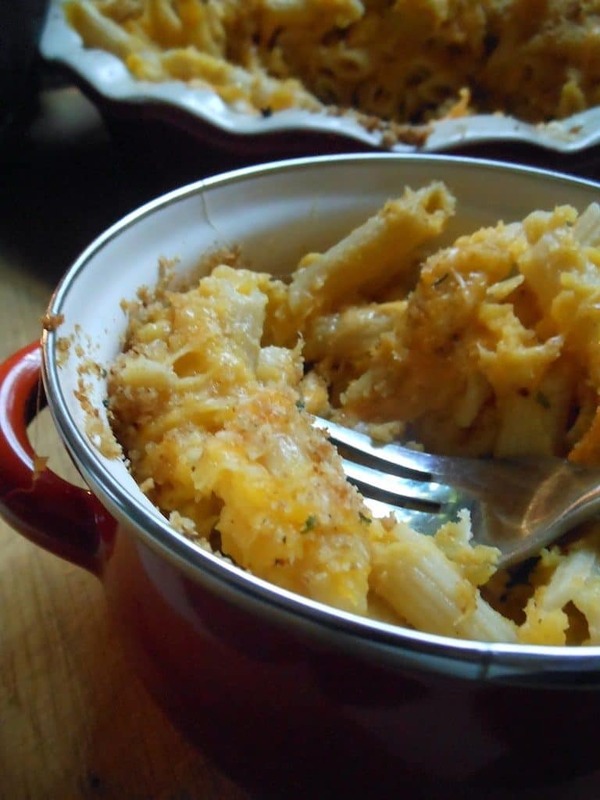 Stir the melted butter with the seasoned bread crumbs and sprinkle evenly over the pasta in the baking dish. Bake for about 20 minutes, or until the bread crumbs are golden brown. 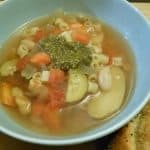 It’s finally (kind of) cold outside; what’s your favorite warm you up thing to eat? I want this for lunch. Today. Which, is sad for me because it will not be happening. I may try this next week though! Ellie has never liked macaroni and cheese, but she might eat this! I know I will. And really, that’s all that matters 🙂 Great recipe and GREAT photos! Thank you! It’s cold! This stuff is so super good. And full of good-for-you things! oh my.. now that is a new one on me and one I will most definitely have to try.. love all those ingredients and i know my family will gobble that up !! Let me know how it works out!!! This is one of my favorites currently. I’m pretty happy about the leftovers. Beautiful! 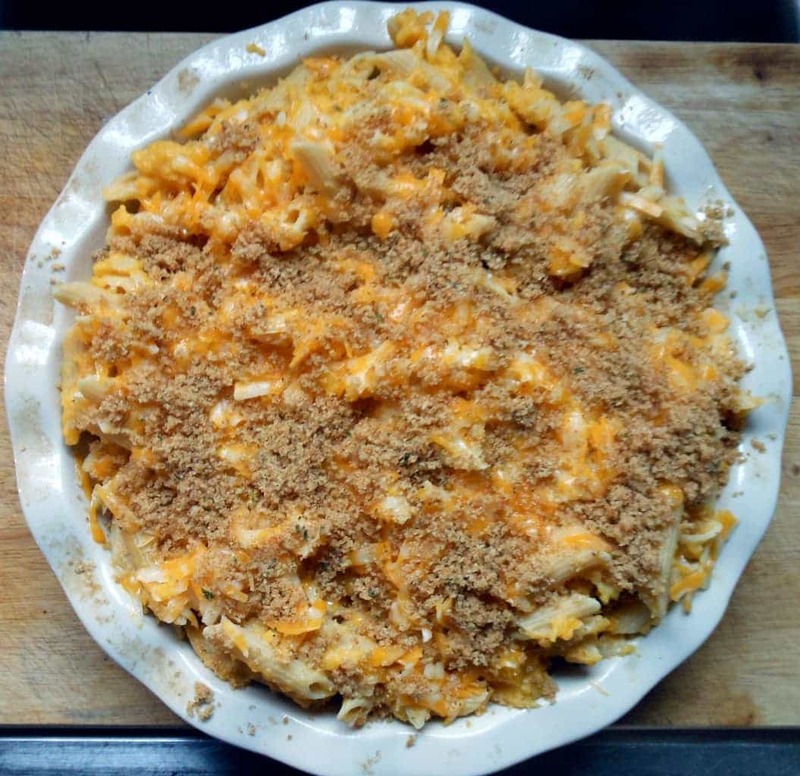 Mac ‘n cheese is going gourmet, and never looked so scrumptious. Love the combination! Too much cheese going on here, but it DOES look proper comforting and perfect for the sort of weather we all seem to be having at the moment! It tried to snow here today, and it was coming down quite well, but it was also wet so nothing stuck! hopefully tonight…. In the meantime I’m going to make “Deconstructed Shepherds Pie” (basically just mince and mashed potato, but it sounds fancier the first way!) as my comfort food for non-snowy rainy days! That sounds amazing. I knew the cheese wouldn’t be your thing, but I made a Whiskey Sour Cake going up later this week that’s right up your alley! Why must you torture me lol jk This looks AWESOME!!!!!!!!!!!!!!!!!!! 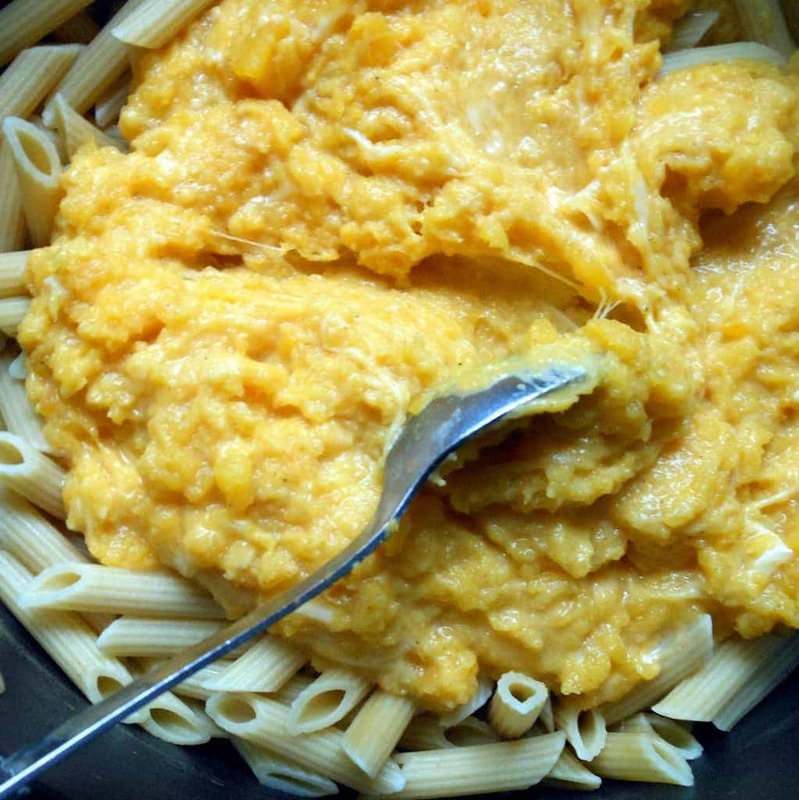 Never thought to put butternut and mac and cheese together, but heck yes please!!! Looks really yummy!!! I calculated the calories and for a rather hefty portion (like this whole recipe divided into 10 — it makes A LOT) it came up to 481. Not bad for comfort food in my opinion. I just had macaroni instead of cake 🙂 Worth it. 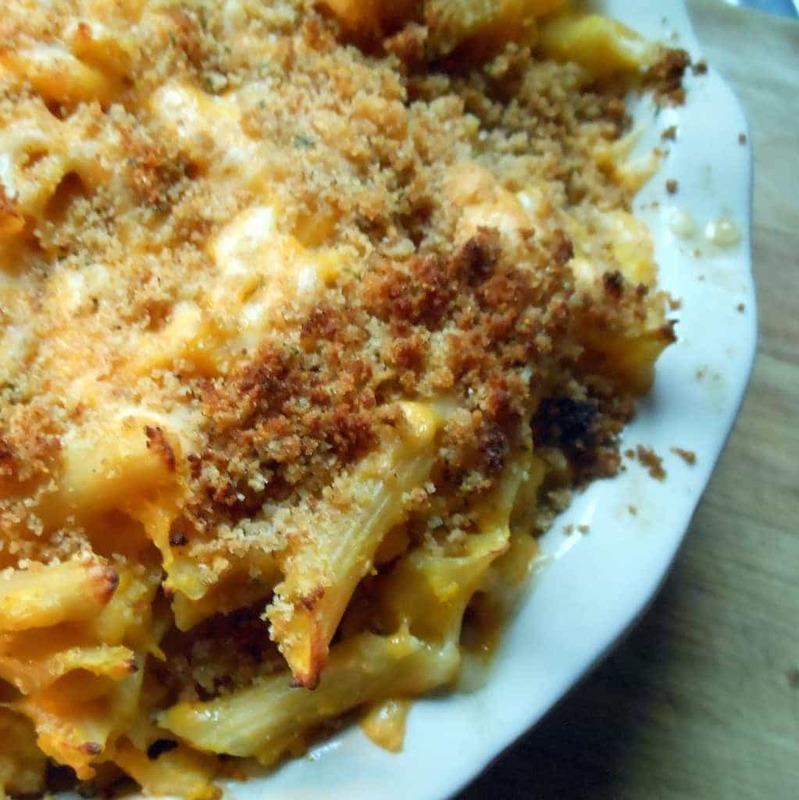 Okay, this looks amazing and now I’m craving mac and cheese. I’ve even got on my flannel pants. 🙂 Thanks so much for linking up at What’s In Your Kitchen Wednesday! Hey, Ashley! I swapped the flannel pants out for yoga pants but they are still totally doing the trick. I never get sick of mac ‘n’ cheese. It’s like a medium of its own- you can add alllll kinds of things! Love your Wednesday posts! OMG. I can definitely use this to get squash in my hubby without him knowing it! Thanks Heather for posting this one…….